The Karaite Jews of America recently published The Sayings of Moshe: Insights on Living by the Tanakh. This work is a collection of sermons and Divrei Torah by the late Rabbi Moshe ben Shabbetai Ratzon, an Egyptian-born Karaite Jew who was part of the 20th century exodus of Jews from Egypt. Of note, Rabbi Moshe was not afraid to blaze his own path and differ with his Karaite co-religionists (to say nothing of the rabbinic mainstream). Rabbi Moshe’s fresh perspectives demonstrate that Karaite thought is alive and well. Today, I interview James Walker who translated The Sayings of Moshe (Hebrew title: Imerot Moshe). As background, it is fair to say that James Walker (Ya’aqov ben Avraham HaDani) knows Tanakh pretty well, as evidenced by his phenomenal performance in the Hebrew Tanakh competition. He also has translated, Esther Explained, for The Karaite Press, and led a learning on blue fringes for my learning series. (I promise, I’ll get back to doing more learnings soon.) So, he is the perfect person to translate a book on insights on living by the Tanakh. BTW, he also is involved in a local Rabbanite synagogue and is also a Mesharet (assistant leader) of the Hebrew Family of Charlotte (a historically Black congregation founded in the 1960s). 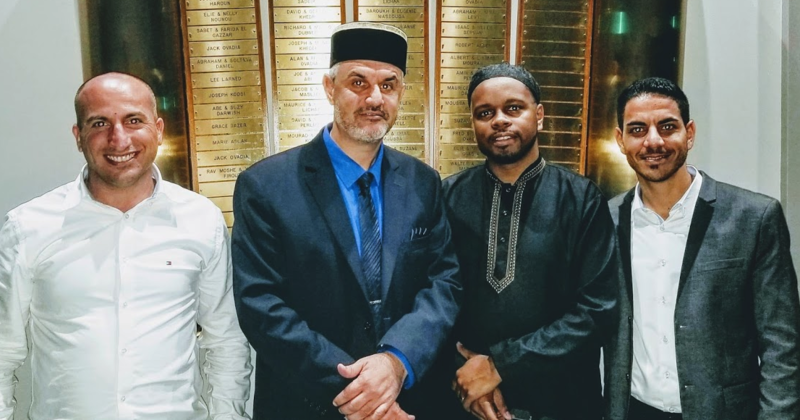 Before we get started talking about the work, I want to point out that James spent August 17-19 with us in Daly City and was the hazzan for the Friday evening service at the Karaite Jews of America. He was so good that a local congregant exclaimed, “My God . . . what a pleasure to listen to him.” Eli Shemuel, the President of the Karaite Community in Israel, said that James sounded like someone who has been the hazzan for 200 services not one making his debut. In honor of James’s Hazzanut, the KJA is selling copies of The Sayings of Moshe for $14 for the next two weeks. So, I will start with a question regarding his experience on hazzanut and our rededication weekend. So, after all the hours of practice and study, how do you feel about the experience and the weekend in general?I must honestly say that this building dedication Shabbaton will stay with me for the rest of my life. Most importantly, the ability to praise God in the congregation of believers in a way that conveyed the power of biblical prayer was a honor beyond any title. How did you first hear about The Sayings of Moshe?I was first exposed to this and many other thought-provoking works in the “Digital Library” of Karaim.net during the mid 2000s as a regular contributor to what was then the most active online community of Israeli Karaites. Imerot Moshe was freely published by Mr. Moshe Ratzon (the former VP of the movement), and even then, I secured permission from the author to translate the work one day. As someone who was learning Hebrew by studying the Bible, this uplifting collection of speeches, sermons, and essays were also an accessible means of becoming comfortable with Hebrew as a living language. What part of the book impacted you the most?The greatest thing about this book is just how hard it is to answer that question. I think the best way to get a sense of the poetry and teaching style that Rabbi Moshe (of blessed memory) used through all 250 pages of the book is to study his approach to the Decalogue (the Ten Commandments) in Chapter 9, which was his message for Parashat Yithro (Exodus 18-20). First, he highlights the fact that the Torah portion is named for a Gentile who embraced faith in the God of Israel who nonetheless merited the respect and admiration of Moses himself. Secondly, he provided a verse-by-verse exploration of the way the hundreds of commandments and complexities of modern life connect to those simple words chiseled in stone 3,400 years ago. Lastly, he ends (as always) with a brief prayer and prophecy: asking the Holy of Israel to write the Torah in our hearts. These three things: his recognition of converts and returnees to faith, his practical teachings meant for a 21st century audience, and ultimately his uncompromising use of all of the Tanakh (including prophecy) to understand how we can deepen our walk with God, are just a glimpse of what it must have been like to hear him teach in Israel. If readers wanted to get a glimpse of Rabbi Moshe’s worldview, which chapter should they start with?I think Mr. Elisha Ratzon, the author’s son and compiler of the original Hebrew edition, was wise to place the essay called “Strange Fire” as the leading chapter (Ch. 2 in our edition). With a few opening lines, Rabbi Moshe set the record straight on misconceptions regarding the history of Biblical Judaism as preserved by the Karaite community. Just as refreshing, however, is his call for dialogue and cooperation with our Rabbinic brothers throughout this and the other chapters of the book, and a resistance to becoming bitter and resentful towards each other. Moreover, rather than attacking stylistic differences between communities, the Rabbi uses history, sociology, and Scripture to examine the motivations for thousands of families over the last 12 centuries to challenge Rabbinic authority and risk everything to follow Anan ben David’s call to no long offer “Strange Fire” (unbiblical rituals) when worshipping the God of Israel. His plea for brotherhood and prayer for Divine restoration is a powerful lesson on how Karaites can and should outreach to disaffected members and other communities, alike. How is this work different from other works that the Karaite Jews of America and The Karaite Press have published?This is the first major work to be translated that was published in the 2000s by a member of the pioneer generation who led the community out of Egypt into Israel the 1950s. This makes an English translation of this life’s work especially important as that generation fades into history, and the future of the movement rests on those who can speak movingly to modern realities without compromising on the truth of Scripture. For example, in his final chapter, (18) “The Nation of Israel, and the Land of Israel”, he reflects frankly on the dual challenges of modern Karaites: secularism on the left and bigotry from the Rabbinical establishment on the right. Such complex issues have been explored in depth by our scholars over the past 1200 years, and The Karaite Press and the Karaite Jews of America has been committed to bringing those rare gems to the masses, but “The Sayings of Moshe” makes it easy for a seeker to begin navigating those controversial issues (as well as difficult Torah portions) guided by Biblical wisdom offered by a wise man who spent years mastering those classics. Is there anything else you wish to share?I am continually grateful to the Creator for being able to convey the best of what has been preserved by our movement in the Sacred Language of Hebrew to an English-speaking audience. Even more important, however, is in turning readers to the Sacred Scriptures themselves – just as Rabbi Moshe (of blessed memory) did when he incorporated 294 verses throughout this selection of teachings. He repeatedly reminded people to search the Scriptures well, and not to rely only upon his understanding, and so I also encourage everyone not only to order copies of this book for personal study and outreach, but to study each verse in context with an open copy of the Tanakh (Hebrew Bible) to explore the deeper significance of what had to share. May his memory become a blessing to future generations as we commemorate 70 years since pioneers like him made the physical and spiritual restoration of Israel a reality. For clearly it can be witnessed that YHWH is utilizing the gifts he innately brought into you, and that you have chosen to SHEMA and follow HIS direction in fulfilling your purpose here in this earthly realm. For this, Every Karaite who is seeking clearer Tanakh understanding, is forever THANKFUL and GRATEFUL for your contributions and work in bringing these English translations to us! I was blessed to be present in Daly City to witness the Hazzan bring to us the beautiful Karaite Hebrew friday evening service to B’nai Israel’s Synagogue Re-dedication. It is a memory of JOY and Fulfillment that I will never forget! To ALL in the B’Nai Israel Congregation, Thank you for your open armed welcoming and your warmth, and may you be blessed to offer and have MANY more Karaite educational presentations in your new Cultural and Educational Center!